It’s time to go Glengarry Glen Ross on dual-core processors in gaming laptops. As in, hey dual-core processor, I’ve got some bad news for you from downtown: Mitch and Murray said you’re fired because gaming laptops should go to closers. And yes, dual-core, you can’t close the deal on high-end gaming laptops anymore. That’s why we have Origin PC’s EON15-X here. It’s a closer. What makes it a closer? The desktop-grade Core i7-4790K CPU powering it. Yes, that’s none other than Intel’s Devil’s Canyon CPU. While most mobile gaming quad cores struggle to crack the 3GHz barrier, the Core i7-4790K in the EON150X cruises along at 4GHz and will Turbo up to 4.4GHz. I don’t want to totally bum out those still driving dual-core chips. Those chips have a place in more cost-conscious laptops and ultrabooks but the era seems to be drawing to a close for burly gaming units. 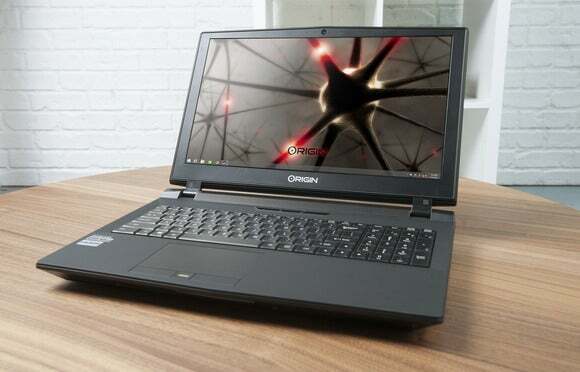 Origin PC’s desktop chip in a laptop play isn’t just about clock speeds though: It might also be about price. Origin’s EON15-X packs a desktop Devil’s Canyon inside instead of the typical mobile chip. If you look at Intel’s price sheet, its fastest quad-cores are $1,100—and even then, they still run at 75 percent the clock speeds of the CPU in the EON15-X. That translates into a hefty chunk of change that goes to Intel, compared to the $340 for the Core i7-4790K CPU in the EON15-X. That doesn’t make the EON15-X necessarily a cheap laptop, though. At $2,661, it’s by no means an HP Streambook. That cost, though, gets you a quad-core ticking along at 4GHz at a minimum and Nvidia’s top-dog GPU: the GeForce GTX 980M with 8GB of video RAM. You also get 8GB of DDR/1600 RAM, and a 1TB hybrid hard drive. Origin knows a hybrid hard drive won’t impress, so it also includes an M.2 PCIe SSD inside—none other than a 240GB Samsung XP941. I’ll have to say, this is only the second time I’ve seen the XP941 in a laptop, but I wouldn’t mind seeing more PCIe SSDs. The drive will cruise along at 1GB/s in read speeds. In M.2 SSD form, it’s only eclipsed by its newer sibling, the Samsung SM951, which ups the speeds to around 1.5GB/s. The EON15-X features two DisplayPorts along with an HDMI out. You get three USB 3.0, a Gigabit ethernet, and a combo USB and eSATA (remember those?) port, plus an SD card reader. There’s also a full set of analog audio ports along with SPDIF. Wireless is an Intel combo 802.11ac and Bluetooth 4.0. The keys have an odd sculpted shape to them that I’m not completely a fan of, but the trackpad isn’t bad. The lid on the laptop and top keyboard deck has a light rubberized coating too. It makes the laptop a little less slippery when hefting. The laptop weighs in at a hefty 7.7 pounds on your lap and pushes 10 with its power brick. You probably won’t lug it with you every day, but it’s manageable for hiking to your buddy’s house for an ad-hoc LAN party or bringing it to your relatives’ house to cut video. And that’s the use case that will make you glad you have not just a quad-core but one that runs at high clock speeds too. With its 4GHz CPU, it makes quick work of encoding and video tasks. The desktop Devil’s Canyon easily runs away from all of the mobile quad-cores including our desktop zero point with its Core i7-4770K too. That long bar, that’s a dual-core. I compared the EON15-X to MSI’s monsterish GT80 Titan SLI with its mobile quad-core Haswell, as well as an older Eurocom P150EM with a quad-core Ivy Bridge CPU inside. The Devil’s Canyon easily runs away from them. 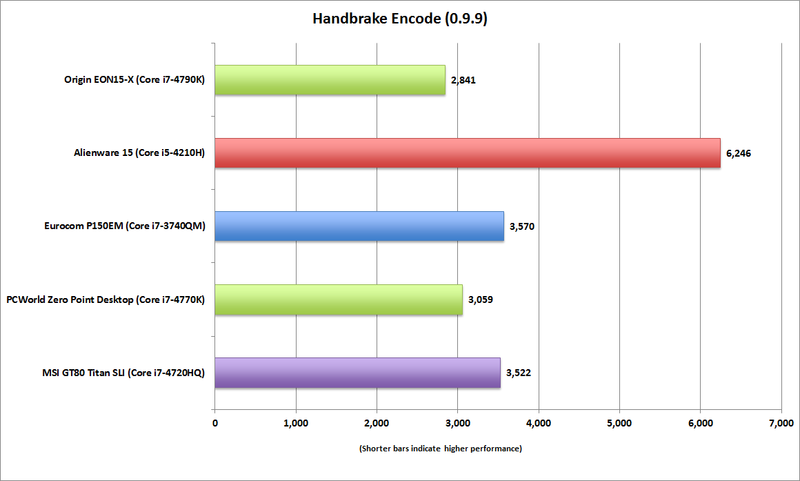 For more context, I also threw in the same encoding task on our zero-point, a quad-core Core i7-4770K desktop chip. If you were wondering whether the thermal limits of a laptop would make it slower than the desktop, it doesn’t. I also tossed in numbers from the budget-focused Alienware 15 with a dual-core Haswell CPU. You can see the impact of the two fewer cores on tasks that can truly use all of the CPU cores. See why dual-cores aren’t closers anymore? Origin PC actually offers an overclocking option on the laptop, but I don’t think I received it. For the most part the Core i7-4790K would operate at 4.2GHz during loads. It would start at 4.4GHz but within a few minutes would fall back to 4.2GHz. I suspect heat was the reason. I also compared it to PCWorld’s zero-point desktop with its Core i7-4770K chip. That CPU has a stock clock of 3.5GHz with a Turbo Boost of 3.9GHz. But since it’s not confined to a thin 7-pound chassis, it appears to run at top clock a lot longer. Frankly, this makes the EON15-X probably the fastest laptop we’ve seen for chores that will use all of the CPU resources. 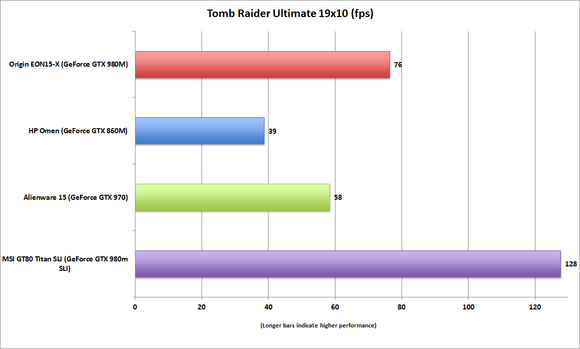 The GeForce GTX 980m will play Tomb Raider set to Ultimate at 1920x1080 resolution above the magical 60 fps minimum. Gaming is the other story on the EON15-X, and the GeForce GTX 980M continues to show its prowess. For comparison, I ran Tomb Raider at 1920x1080 set to Ultimate quality: The EON15-X loses only to the massive MSI GT80 Titan SLI, with its pair of 980M GPUs. The Alienware 15 is faster with its Amplifier option and appropriate card, but certainly not as portable. 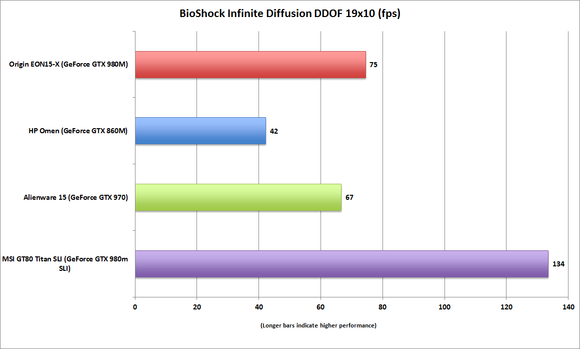 Bioshock Infinite is getting long in the tooth and no much work for either the GeForce GTX 980m or GeForce GTX 970m GPUs. The upshot of the gaming performance on the EON15-X is that will likely play all of today’s games at 60 fps at its native resolution at max settings or with just a few tweaks to keep the frame rates up. One of my bigger issues with the EON15-X is its screen. I measured it at 200 nits when set on maximum—and yes, that’s when plugged into the wall. It simply looks dim and dusty next to the other displays I’ve seen, and it’s damn near a deal-breaker—and actually a bit of a heart-breaker, because the performance of the laptop is top-notch and can only be beat by SLI systems at this point. The good news is it may only be an issue with our original review unit. Origin PC sent a duplicate EON15-X and that one I measured at 349 nits. Origin PC officials said they the screens are spec'ed to hit 300 nits minimum. Bring your power brick: As you expected, this big gaming laptop with its desktop CPU chews through its battery fairly quickly doing common office tasks. Battery life, as expected, isn’t great either. 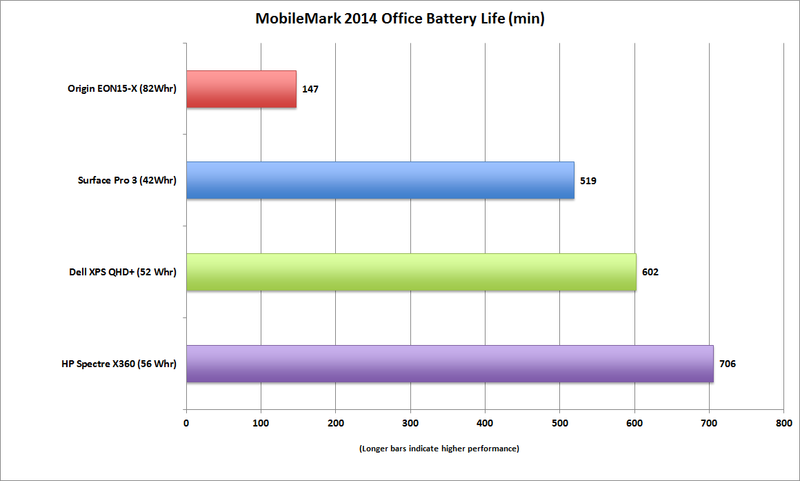 Because the EON15-X is almost light enough to use as a mobile unit on occasion, I wanted to see how it would do purely as an Office drone machine when off the grid, so I ran MobileMark 2014 on it. It’s our standard run-down test for Ultrabooks and thin-and-light laptops. The laptop sucked its 82-Whr battery dry in 147 minutes doing boring work-related stuff. 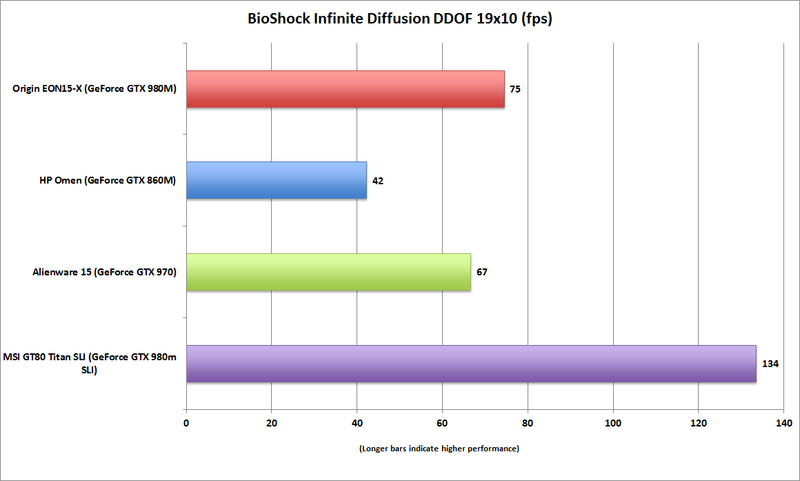 Crank up a game and put that GPU to work, or encode a large video, and expect to get even less run time. I really don’t hold it against the EON15-X, as it is a performance-oriented gaming laptop, but you should definitely be aware of this liability. 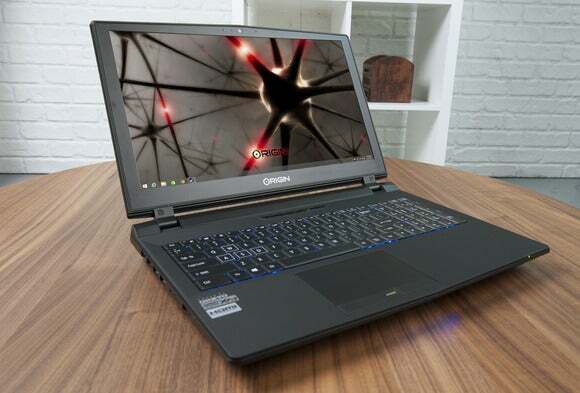 Like all gaming laptops, the Origin EON15-X features easy access to its guts. 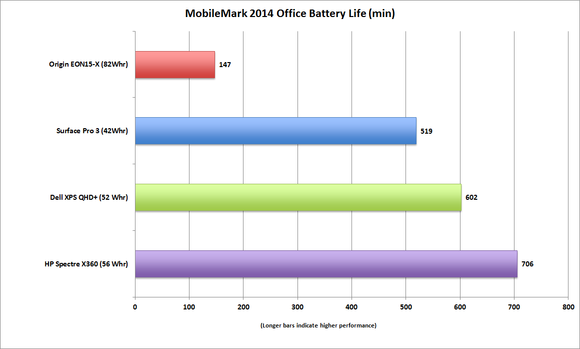 The EON15-X offers top of the line performance that’s really only hurt by a dismal screen and mediocre battery life. After our review ran Origin PC contacted us to say the low brightness issue on our review unit wasn't to spec. Although the unit didn't appear to have any thing obviously damaged such as the backlighting section off. Origin PC officials said they spec the panel at 300 nits or higher and I measured ours dead center at 349 nits and have amended our review to reflect the higher output screen.